Georgii Mikhailovich Beriev produced his first original design, Aircraft No. 25, at the Menzhinsky plant in Moscow in 1932. The B.M.W. VIF-powered prototype was transported to Sevastopol on the Black Sea for flight tests, and proving successful the new flying-boat went into production as the MBR-2 (Morskoy Blizhnii Razvedchik, or naval short-range reconnaissance). In production form it was powered by a Soviet-built M-17B inline engine. Deliveries of the MBR-2M-17 intended for use in the short-range bombing and maritime reconnaissance roles, began in 1934. 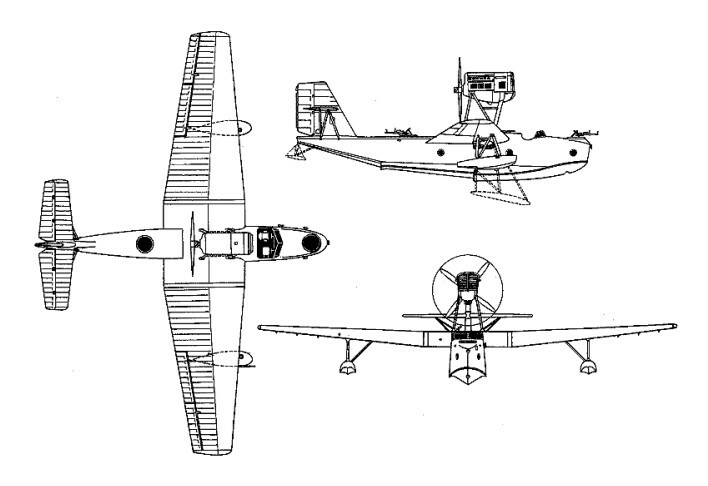 It was a shoulder-wing cantilever monoplane, with its M-17B engine mounted on a pair of N-struts over the wing; it had a two-step wooden hull with plywood covering, and the pilot's cockpit located just in front of the wing. A strut-braced horizontal tailplane was set high on the single fin. Bow and midships gunners each had a single 7.62mm PV-1 machine-gun. In 1935, with the first production version already in service, Beriev carried out a redesign of the MBR-2. The pilot's cockpit was fully enclosed, and the midships gunner's position protected by a glazed cupola. The M-17B engine was replaced by the M-34NB (redesignated AM-34NB in 1937) of 619kW, and a new curved fin and rudder replaced the original angular vertical tailplane. ShKAS machine-guns supplanted the obsolete PV-1s. The new version was placed in large-scale production, which continued until 1942, when 1,300 of all variants had been built. The MBR-2AM-34 served with all four main Soviet fleets and saw considerable service, first during the Winter War of 1939-40 with Finland, and then throughout the Great Patriotic War of 1941-5. It was tough, reliable and could be fitted with wheel or ski landing gear. Post-war, the MBR-2 served for nearly a decade on fishery patrol duties; it received the NATO codename 'Mote'. In 1935, with the first production version already in service, Beriev carried out a radical redesign of the MBR-2. The pilot's cockpit was fully enclosed, and the midships gunner's position protected by a glazed cupola; the M-17B engine was replaced by the M-34NB (redesignated AM-34NB in 1937) of 619kW; an entirely new curved fin and rudder replaced the original angular vertical tailplane; and ShKAS machine-guns supplanted the obsolete PV-1s. A 1937 civil development of the MBR-2AM-34, with similar capacity to that of the MP-1; one MP-1 bis, piloted by Paulina Osipenka, established a number of women's world records; between 22 and 25 May 1937 she attained respectively 7605m with a 500kg payload and 7000m with a 1000kg payload; on 2 July the same year she made a non-stop flight of 2416km between Novgorod and Archangelsk.